Matador and the Canadian Tourism Commission (CTC) partnered up this year, sending journalists from the Yukon Territory to Vancouver Island to Newfoundland and everywhere in between (check out their reports here). We wanted to finish out our partnership by including your favorite places around Canada as well in our #ExploreCanada contest. 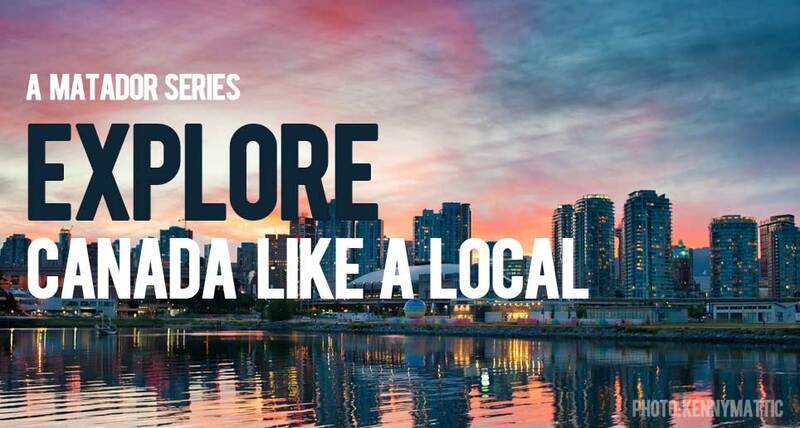 Entries to the contest are based around “spots” — from your favourite restaurants to most relaxing parks to fascinating museums — which would be helpful for others exploring Canada. We’re giving away cold hard cash and tuition to MatadorU to those who send us the best entries. A Spot could be your favorite ski resort, bar, bagel shop, yoga studio, music venue, hiking trail, art gallery, etc. If it’s got a physical location, it’s a Spot. A List is a collection of five (5) or more related Spots. Your List might revolve around a general theme and/or geographic location (e.g., “Best music venues in Vancouver”). 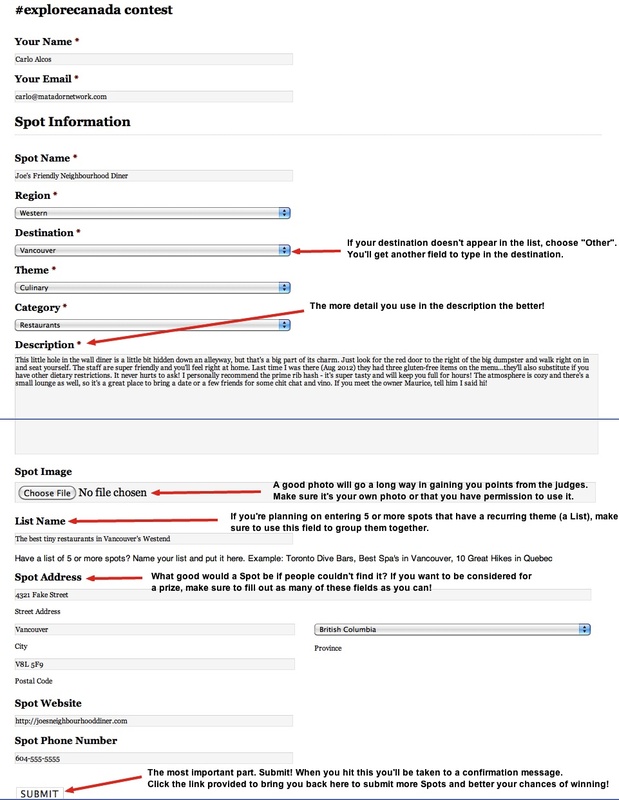 If you’re submitting a List, don’t forget to include your List Name in the appropriate field for each Spot submission. Fill out the form at the bottom of this page, making sure to include the required fields (marked by an asterisk). 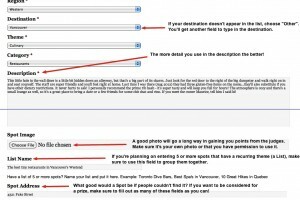 Remember, the more detailed your entries are, the better your chance of winning. Click the image to the right for a sample entry. Best List: “The Weekend Warriors’ Guide to Backpacking the Canadian Rockies,” by Skiles Katharine Hornig. Best Spot: “Yer Mad,” Montreal, by Lydia Cheng. Most Spots: Thanks to Sherel Purcell for submitting 13 Spots! Congratulations also to our 3 runners-up: Jozef Kuracina, Joseph Cyr, and Tara Lowry!